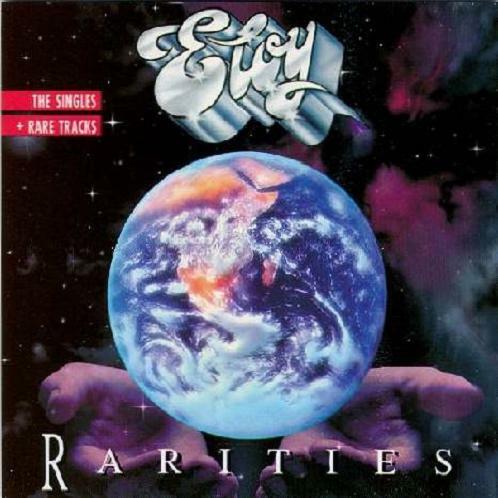 Good compilation of ELOY tracks here, ranging from 1973 to 1984. However, "Rarities" is be a little exaggerated as a title: only 60% of the tracks are rare. So I will only focus on these novelties. The first half of the disc is hardly composed of A and B sides that cannot be found on official albums/lives. It opens energetically with the psychedelic hard rock instrumental "Daybreak", carved in the same stone than the "Floating" album. "On the Road" sounds very DEEP PURPLE-ish with its omnipresent organ and is very catchy. The best rarity here is the cosmic mini-epic "Child Migration" (different and as less as good as the track of the same name from "Colours"). The song begins with a spacey synthesizer to go on with high-pitched vocals and powerful guitars, definitely worth the trip. The calms reappears with "Let the Sun Rise in Your Brain", relaxing musical piece featuring beautiful flute playing. On the contrary, "Wings of Vision" is not much welcomed in this compilation as it is a little bit cheesy. The second half of the compilation is merely composed of top tracks taken from ELOY's classic 80's albums ("Colours", "Planets", "Time to Turn" and "Metromania"), with the lengthy version of "Wings of Vision". Not the best place to start to discover the band, but surely a good investment for ELOY and space rock fans. NOTE: "Daybreak" and "On the Road" can now be found as bonus tracks on the remastered edition of "Inside", whereas "Child Migration" and "Let the Sun Rise in Your Brain" are now included as bonuses in the remastered edition of "Silent Cries And Mighty Echoes".